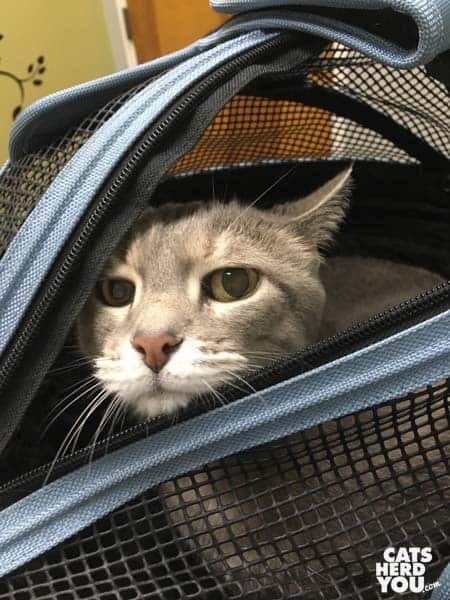 As I mentioned in my previous post, the night before hurricane Irma was due, after the veterinarians and even the nearby veterinary emergency center had closed for the storm, Cupcake started acting strangely. She would play as normal, but whenever she wasn’t distracted, she would make funny faces and paw her own mouth. Since she eats raw food that includes ground bone, my first thought was she had a bone chip between her teeth. There wasn’t going to be any professional help figuring this out, so I had to take a look myself. Cupcake: I don’t want to open up! 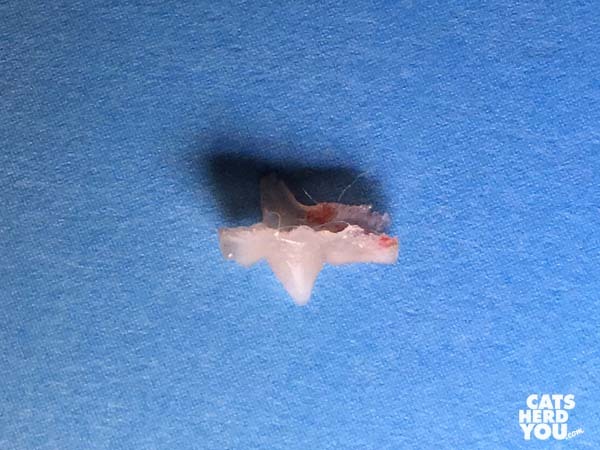 After some false starts since Cupcake really, really didn’t want to open up, we spotted blood all around the base of one of her premolars. That got us in the right general area to try to figure out what was going on. The next step was to try to get a better look at that tooth to see if there was a piece of ground bone stuck next to it. Before we could do that, Cupcake shook her way free of the unwelcome attention. Then she spit something onto the ground. On closer inspection, it was her tooth! 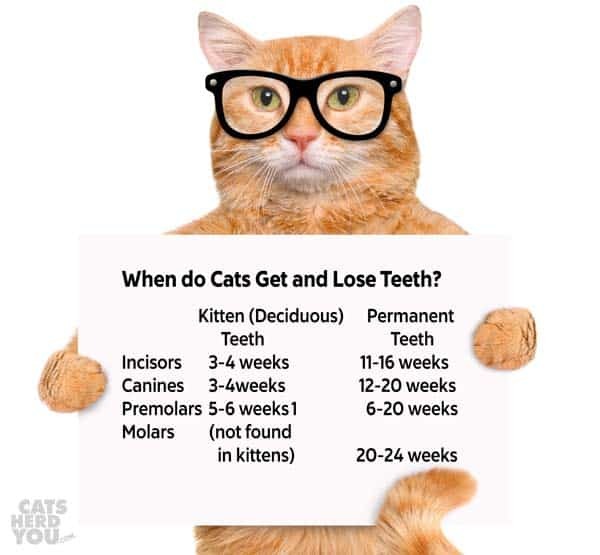 Cats start to lose their primary teeth around 1 weeks, and they finish with their adult teeth around week 24. Cupcake is right around 24 weeks, so this should be the last of premolars to fall out. Cupcake stopped pawing at her mouth and obviously felt better as soon as the loose tooth was out of her mouth, so there want’s any need for her to go to the vet after all. All’s well that ends well, and we won’t forget about kitten baby teeth again! 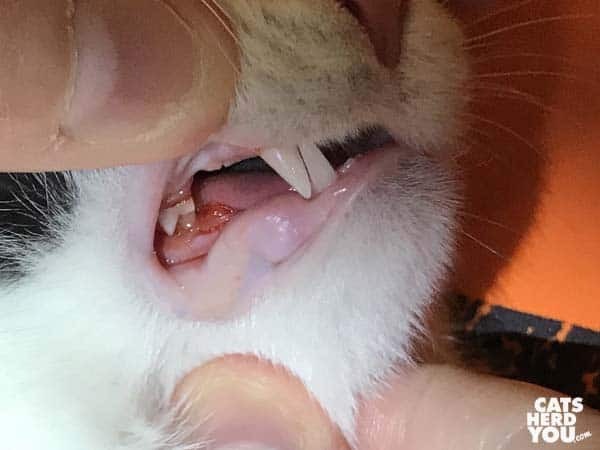 Have you ever seen your kitty’s baby teeth fall out? We’re sharing this message again because tomorrow, like every August 15, is National Check the Chip Day. 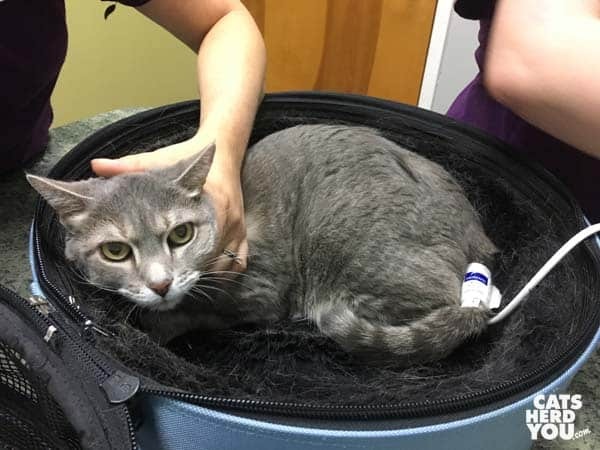 This is a great reminder to all of us that getting your cat microchipped isn’t the only step in the process in giving her a much better chance of getting home. Cats have a 20 times higher chance of being returned to their owners after entering an animal shelter if they are microchipped, but just having the microchip isn’t enough. That chip must be readable and the information must be up to date so the call about your kitty can find you. That’s what Check the Chip Day reminds you about. 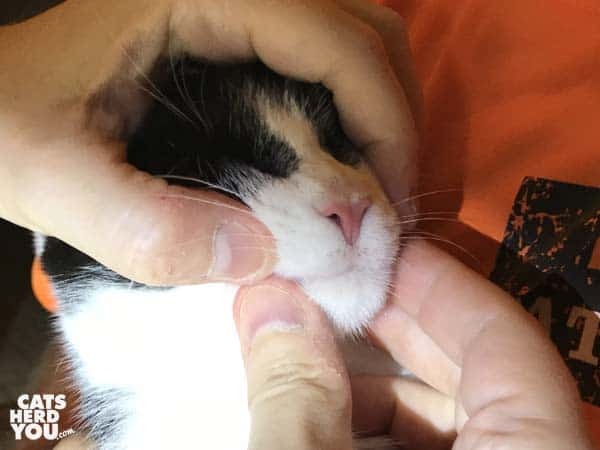 If your kitty isn’t already microchipped, don’t worry, it’s a simple procedure that can be done at your veterinarian’s office. Check with your local rescue organizations and spay-neuter clinics to find reduced-cost and sometimes even free microchips at events in your community. 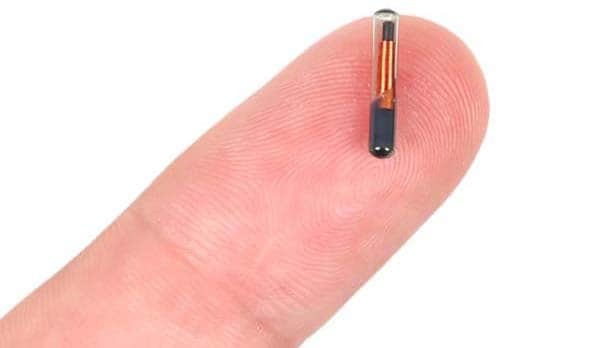 Microchips are a little larger than a grain of rice, and your vet implants them under the skin with a large-gauge needle, much like your cat getting a vaccination. Instead of injecting a fluid, the needle places the microchip. 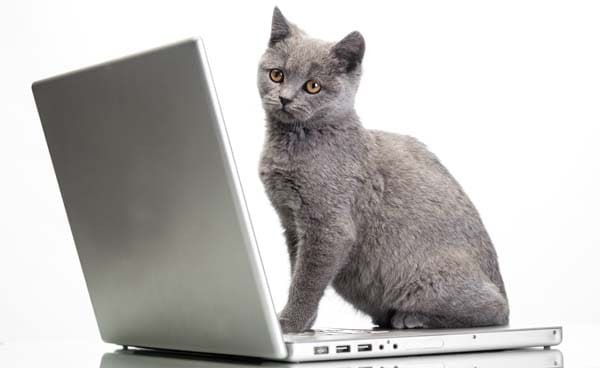 Register your microchip, and keep it up to date if your contact information changes. 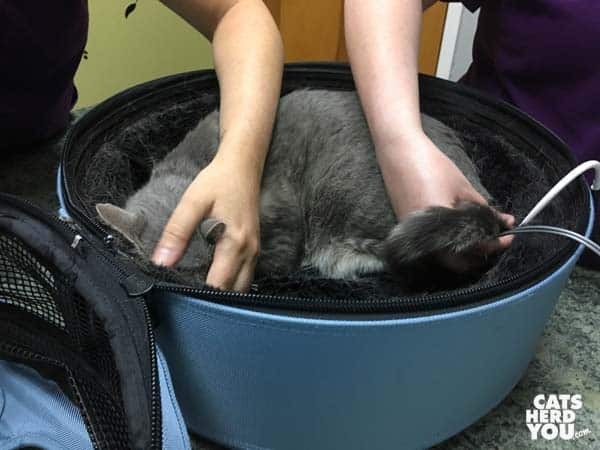 Sometimes the veterinarian or organization who chips your cat will register your cat for you, but it’s best to follow up and make sure the paperwork got to the chip registry if you don’t handle the registration yourself. If you move to a new address or get a new phone number, don’t just tell your friends. Tell the microchip registry, too! This is important because one of the leading causes of microchipped pets not being able to get home is not being able to find the current contact information for the pet’s home. When you and your microchipped kitty move across the country, your old vet who implanted the chip may lose touch with you. If your microchip isn’t registered, the last person the microchip company knew had the chip was your old vet, and a call from an animal shelter trying to get your cat home only finds your old vet’s contact information. You don’t want someone trying to reunite your kitty with you to hit a dead end like that, so keep your contact information up to date with the chip registry. That way, it will be correct when your cat needs you most. Check the chip! Microchips are implanted between the shoulder blades. 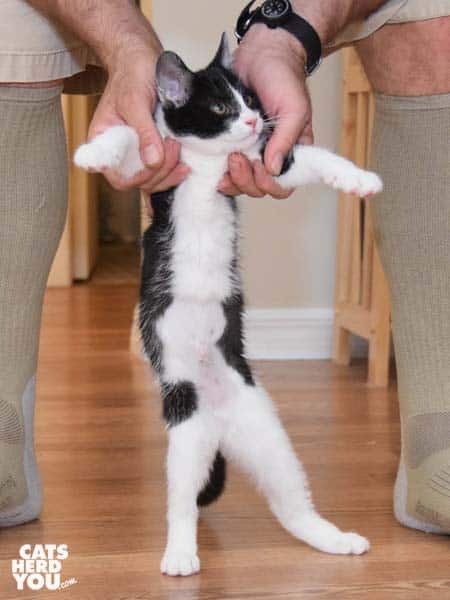 When Ashton was a bony, little kitten, you could feel the chip, about the size of a big grain of rice, if you scritched her shoulders just right, just past the end of her neck at her shoulders. In rare cases, a microchip can migrate. Pierre’s chip has migrated about two inches so you can feel it when you rub his shoulder blade. This is unusual enough that when our vet felt it, he called in some vet techs to feel Pierre’s chip so that they would recognize a migrated chip if they felt one. 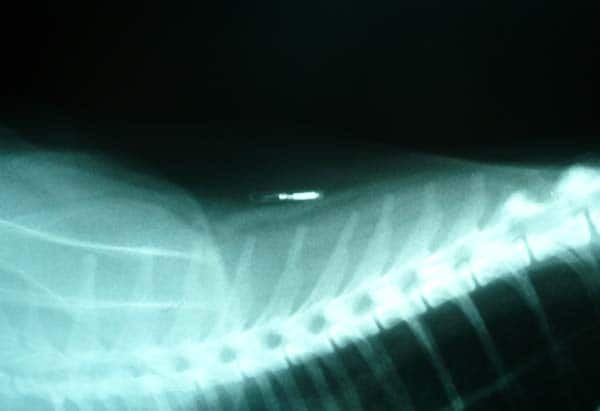 A migrated chip doesn’t hurt your cat, but it can mean that if someone passes a microchip scanner over your pet’s shoulders, the scanner’s electromagnetic field may fail to energize the chip. This can lead to the microchip not being detected. To be sure this hasn’t happened, ask your veterinarian to scan for your cat’s chip as a part of their routine veterinary exam. That’s what Check the Chip Day is about: making sure your cat’s ID is ready when needed. 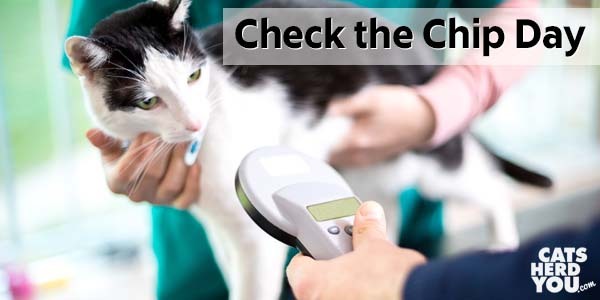 Did you have your cat’s chip checked the last time you visited the vet together? I mentioned last week that Cupcake had hernia surgery just before joining our family, and I got a couple questions about it afterward. So today, we’re going to talk about cat hernias. A hernia is a condition that affects both humans and other species of animals. It means that there is a weak spot in the abdominal muscles or in the diaphragm, and that tissue or organ is bulging through the weak spot. Hernias very from small and nearly unnoticeable to larger, depending on how big the area is of weak muscle. In rare cases, hernias can become dangerous if the contents of the hernia are constricted where they pass through the hernia and can’t get blood flow. 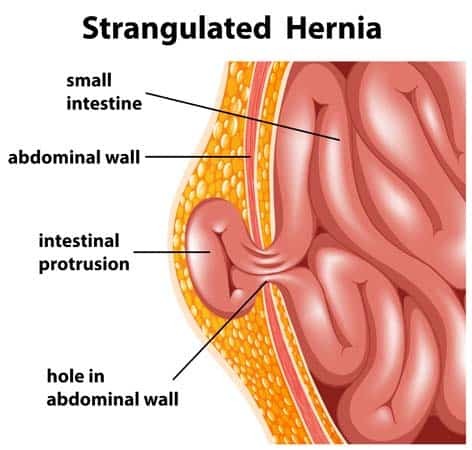 This is called a strangulated hernia. Hernias have different names depending on where on the body they are found. For instance, umbilical hernias are at the site of the belly button, while diaphragmatic hernias are abnormal openings in the diaphragm. Cupcake had an umbilical hernia, the most common hernia in cats. These can be hereditary, but can also be caused if the umbilical cord was pulled too hard or if the mother cat chews the umbilical cord too close to the infant kitten’s belly. 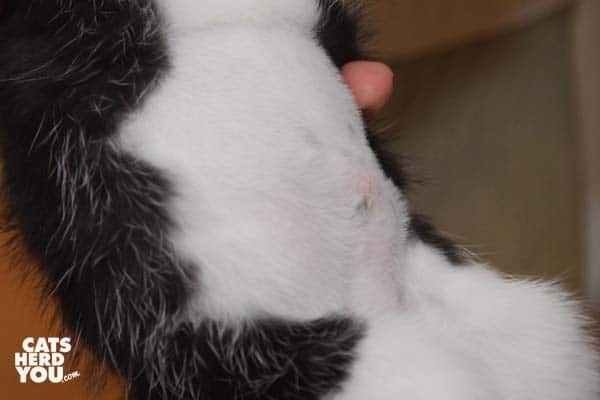 Since a cat’s belly button is actually a small opening where the umbilical blood vessels are attached before the kitten is born, it is a small opening that needs to close in every kitten after birth. 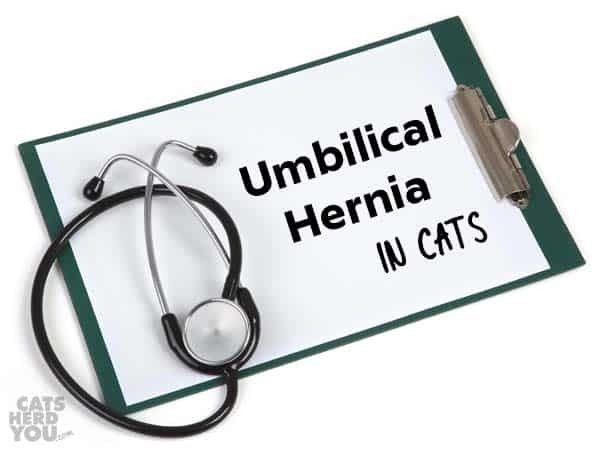 This means that small umbilical hernias are not uncommon with kittens. Small hernias may close on their own while the kitten is growing for her first few months. 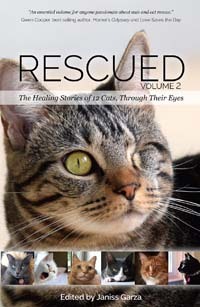 Cupcake’s hernia was small enough that it wasn’t caught until after her spay surgery. But she was nearly three months old, and she was about to take an airplane flight and be adopted. Even though her hernia was small, we decided it was safest to have her hernia taken care of, so she was scheduled for hernia surgery. The surgery for a an umbilical hernia wasn’t more strenuous on her than her spay surgery, and she was able to travel the next day. A week later, the most noticeable thing about her surgery site is that her tummy is shaved. If you look closely, you can see some of the surgical glue left on her fur, and just above that, a pinker bulge where the absorbable stitches are holding together the layers of muscle so they can heal properly. Our vet examined her over the weekend and said she is healing well. We expect the bulge will probably become less noticeable and may even flatten out entirely once she finishes healing. It certainly hasn’t slowed her down a bit! Kittens who go through hernia repair are just as bouncy and rambunctious as any other kittens. So if your vet tells you that your new kitten has an umbilical surgery, don’t panic. Cupcake says that getting all fixed up is a piece of cake. When you go to the doctor, part of your regular checkup is a blood pressure check. 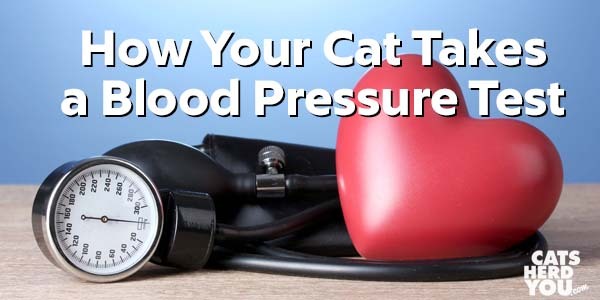 Have you ever wondered how your vet checks a cat’s blood pressure? Pierre had his blood pressure checked, so he’ll be able to demonstrate for us. 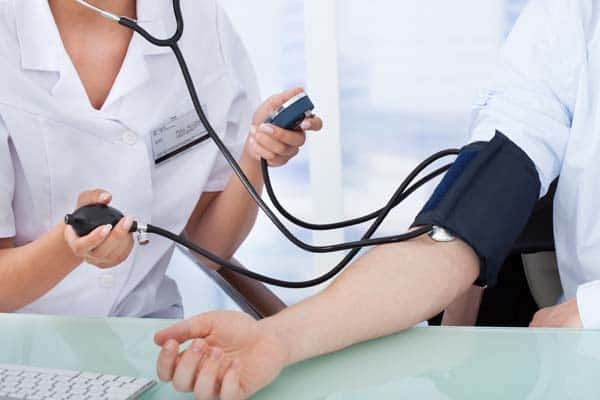 Why Check a Cat’s Blood Pressure? Cats, like humans, can get high blood pressure, especially as they get older. Hypertension in cats can contribute to heart failure. It can also cause sudden blindness when the high blood pressure inside the eye causes the retina to detach. Catching rising blood pressure early can prevent these health complications. You’re probably familiar with the cuff that a nurse inflates on your arm during a blood pressure exam. When the cuff is pumped up, it temporarily cuts off circulation to your arm. The nurse uses a stethoscope to listen for the heartbeat at your inner elbow, where your brachial artery is close to the surface. When the cuff starts to slowly deflate, the nurse records the pressure at which the heartbeat begins to be audible through the stethoscope (systolic blood pressure) and the pressure where your heartbeat is no longer audible (the diastolic blood pressure). The process in cats is similar. 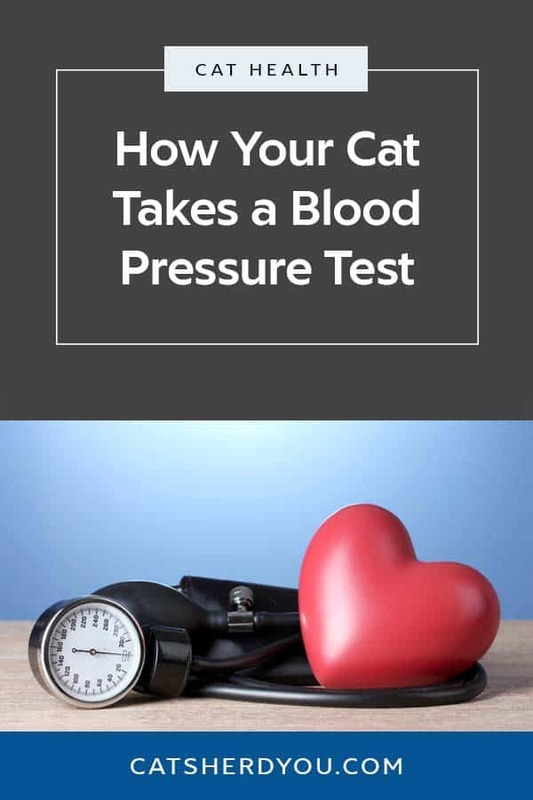 The biggest difference is that cats have much smaller blood vessels than we do, so a stethoscope won’t work when listening for a pulse during blood pressure measurement. Instead, vets usually use a doppler ultrasound machine. A doppler ultrasound machine sends and receives sound waves that bounce off the blood cells inside a blood vessel. Moving blood cells cause the sound to change, so your vet tech can use it to hear a cat’s pulse. 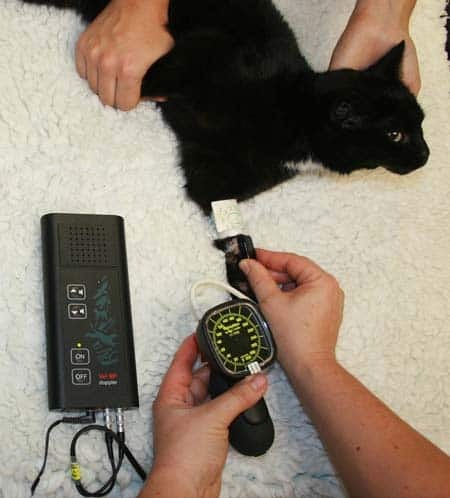 Some vet techs put a specially-pet-sized blood pressure cuff on your cat’s leg, where they can listen to the pulse in the common digital artery. 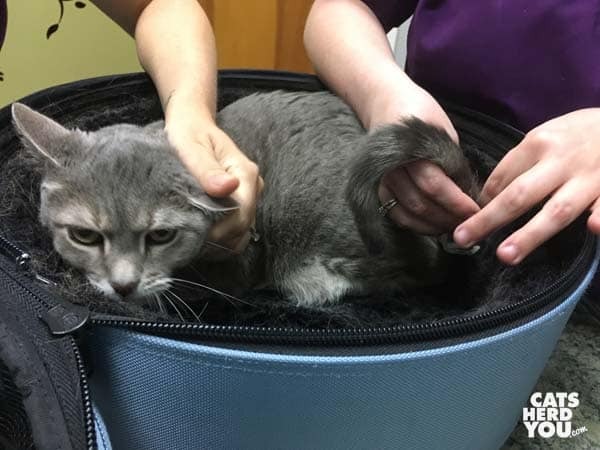 The techs at our vet use the cat’s tail, where they can monitor the coccygeal artery. Some vet techs will clip a small spot of hair to give better access to the skin where they place the probe from the doppler machine against the skin, but they were able to part and wet Pierre’s short fur with rubbing alcohol instead so they could press the probe in the right spot to hear his pulse. Then the vet tech inflates the cuff and listens as it deflates several times. There wasn’t really much to see when this is going on, other than Pierre getting increasingly annoyed with something pinching his tail. A doppler machine doesn’t give a very good diastolic measurement, so instead of two numbers for his blood pressure, Pierre only got one number, the systolic measurement, which was 170. That value is a higher than the normal 80–140 mm Hg, but Pierre gets pretty scared at the vet. Adjusted for “white coat syndrome,” his blood pressure is still a little high, so we’ll be watching it in the future. What About Those Automated Testing Machines? You may have seen automated blood pressure testing devices for humans and wonder why they don’t use those for cats, too. The answer is that they do! 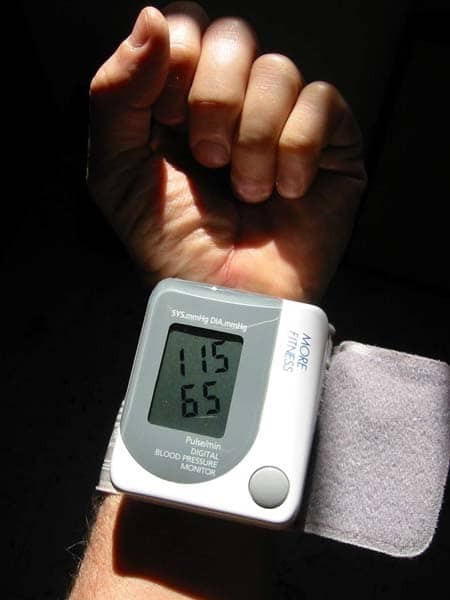 These are called oscillometric blood pressure measurement devices, and they use an electronic sensor with a digital readout of the pressure. These automated devices are not considered by most doctors and veterinarians to be as accurate as the old fashioned way of measuring blood pressure. 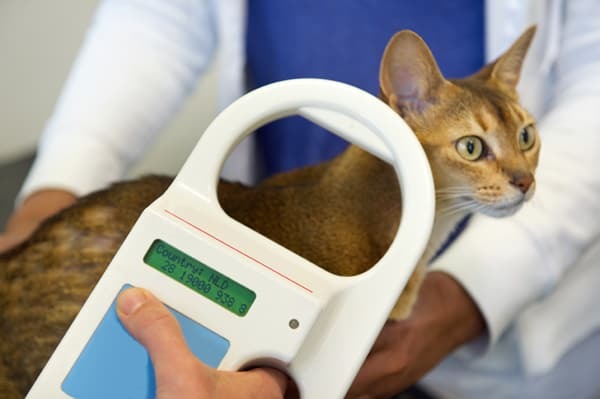 They are also costly, so your vet is more likely to use the doppler method to check your cat’s blood pressure.